The history of Quick Readers is tied to the history of WWII-era paperback printing and the rise of the paperback book. Royce Publishing Company, then located at 188 W. Randolph Street in Chicago, answered the call to send reading material to soldiers with the "Quick Reader" series. Quick Readers were designed to fit into ditty bags or cargo pockets. They were not part of the official Armed Services Editions created by large publishing houses at the time. Instead, the publisher marketed Quick Readers to customers in the United States who would pass along these titles to soldiers. Sending books to soldiers was a popular sentiment at the time, as many books printed in the era suggest. Reading was second only to movies as the preferred pastime of soldiers, according to librarians who worked to provide them with books. Royce began publishing Quick Readers in 1943. Ben Hecht, one of Chicago's own, was featured in two titles. 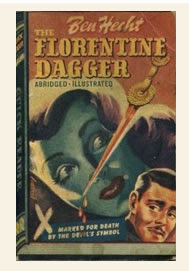 Popular pulp novelists were included, such as Hugh Pentecost (Judson Phillips), along with popular humorists, such as James Thurber and Anita Loos. In addition, Quick Readers published popular stories made into movies, such as Damon Runyon's Little Miss Marker and Bringing Up Baby. Hagar Wilde wrote the original story for "Bringing Up Baby," which was first published in Collier's Weekly magazine on April 10, 1937. The story reappeared in book format in Quick Reader 143, Great Comedies Made Into Movies. Then, as now, titles that promised to titillate were the most popular. The first title in the series is Breath-Taking Stories of Passion and Crime, by Guy de Maupassant, the father of the short story. Of course, to indicate their high-mindedness, Royce also published abridged versions of the Bible and Webster's Dictionary. These miniature books measure 4.5" in height and 3" in width. Many are collections of stories or humorous sketches; full novels were abridged to fit the miniature format. All Quick Readers include four-color illustrated covers; stories were also illustrated. These miniature paperbacks were staple bound and printed on World War II-era inexpensive pulp paper. They were not meant to last, unlike hardcover titles. In a nod (or maybe a wink) to traditional bound books, every title in the series has a tromp d'oeil spine and bottom fore edge as part of the cover illustration (something that McSweeney's Quarterly updated beautifully with their hardcover Issue No. 39 in April, 2011.) Royce published forty-eight Quick Reader titles. Because of their smaller title list and print runs, Quick Readers are less ubiquitous than the Armed Services Edition paperbacks of the era. In 1935, Penguin Books began publishing large print runs of popular, reprinted titles (we'll have some vintage Penguin titles here soon), following the lead of a German publishing firm whose plans were waylaid by the Nazi's rise to power. In 1939, Simon & Schuster began publishing "Pocket Books," the first paperback imprint in the United States. Like Penguin, these Pocket Books titles were reprints of hardcover titles. (Paperback originals were not published by major publishing companies until the 1950s.) After the development of the Pocket Books imprint, the most important contribution to the rise of the paperback in the United States was the mass distribution of paperback titles to soldiers through the Council on Books in Wartime. This massive paperback publishing campaign began three years after the first paperback book imprint was established in the United States. "Books are weapons in the war of ideas." In 1942, authors, booksellers, librarians and publishers founded the non-profit Council on Books in Wartime to provide reading materials for soldiers. The following year, this same group began publishing "Armed Services Editions" of classic and popular titles after the Special Services Division of the Army made arrangements with the Council to purchase 50,000 books. The Council's campaign slogan was "Books are weapons in the war of ideas." Because of this government subsidy, Armed Services Editions were distributed to soldiers for free. This distribution was the largest donation of books in history, including more than 123 million copies of 1,322 individual titles. Prior to the development of publishing geared toward soldiers, the government had attempted to supply books to troops with the "Victory Book Campaign" that collected donations from citizens via libraries. Unfortunately, the government found, citizens used this as a way to rid themselves of unwanted books and too few titles of interest were among those books collected during the campaign. In addition, hardcover books were too bulky for soldiers in the field, though they were useful in hospital libraries because of a hardcover book's durability. Thus, Armed Services Editions paperbacks came into being. Quick Readers followed with the new popularity and patriotic visibility of inexpensive paperback books. While ASEs were distributed for free to the military, Quick Readers were sold to the public in the United States. The Council on Books in Wartime held sole rights to a government contract for 50,000 books. They, in turn, placed orders with publishers, many of whom were on the Council. Armed Services Editions were approximately 5.5" long and 3.75" tall. Unlike standard paperbacks, ASEs were staple bound so that they were longer than they were tall. This unusual format came about because publishers could use idle magazine rotary presses between issues and thus save on printing costs by sharing the expense of a printer. Four paperbacks could be printed at a time on a rotary magazine press, stapled, and then cut to size. You can read more about Armed Services Edition paperbacks here, via a special collections exhibition created in the late 1990s at the University of Virginia. 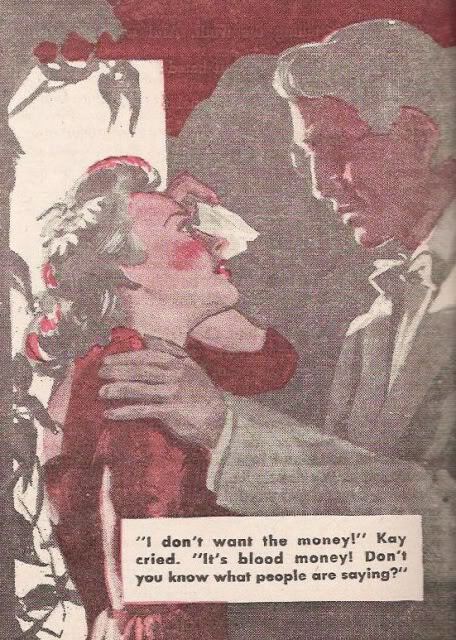 Royce Publishing Company created its miniature Quick Reader series in 1943, the same year in which the Council on Books in Wartime began their publishing campaign. Following the lead of Pocket Books, Royce's Quick Readers featured four-color illustrated covers for audiences in the United States. In contrast, ASE covers leaned toward the simple graphic style of Penguin paperbacks, with a small copy of the original hardcover title as the sole illustration. French authors were popular in the United States at this time. The editorial choices for Quick Readers reflect popular tastes as well as the wartime camaraderie with French allies. As is always done in popular culture during any political or military conflict, the choices of villains reflected the sentiments of the nation toward other cultures. Royce continued to publish through 1946, the same year in which the Council on Books in Wartime campaign was suspended, with the end of fighting in World War II. However, before they ceased publication, Royce Publishing Company created "Trophy Readers" in 1946. This series ended with two books, The Pilditch Puzzle and Smile, Brother, Smile. These titles are slightly larger, approximately 4.5" x 4". Rather than a tromp d'oeil hardbound illustration, Trophy Readers had a faux spiral binding cover illustration. While Armed Services Editions carried the imprimatur of the Council organization, Quick Readers did not. 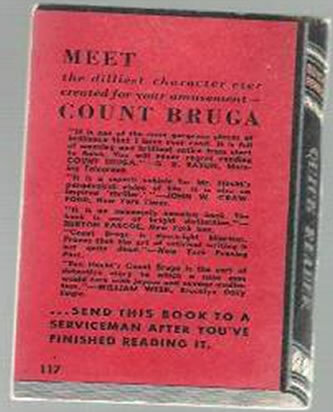 Nevertheless, they made their way into ditty bags with the exhortation, as on the back of Hecht's Count Bruga, below, to send these titles to the troops. 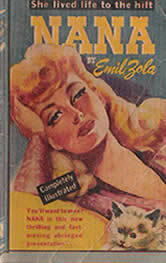 The massive paperback book publishing campaign by the Council spurred the era of the 20th century American paperback. The authors, librarians, publishers, and booksellers working at this time encouraged reading while humor and fiction offered soldiers diversions from the toil of war. The Book Savoury has individual Quick Reader titles for sale, a set of 33 out of 48 Quick Reader titles. You can view titles for sale here.